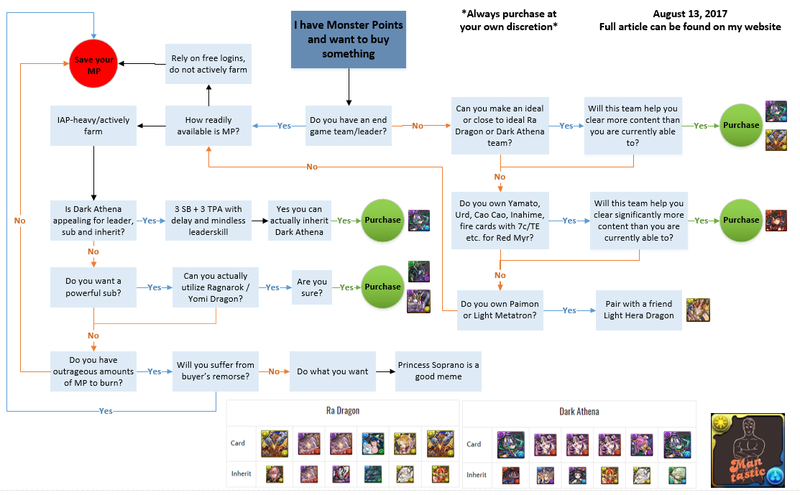 I wish to do a new type of posting series where I discuss current Meta issues along with my future predictions or trends that are happening in Puzzle and Dragons. Let me know what you think of these and whether these are worth continuing. GungHo released the Monster Point (MP) system as a means to help soften the blow of rolling numerous dupes or junk from the Rare Egg Machine. For the most part, this system has been relatively successful as there are now numerous reasons to roll in Godfests as well as allowing players to easily farm MP on their own either through Mythic Rogue descends, PreDRA Infestation, or even just playing Coop. Players who are patient enough to save up 300,000 Monster Points are then able to purchase a special and powerful monster and these are commonly referred to as MP Dragons/4 Gentlemen with a wild Ragnarok Dragon appearing. For a while, some of the MP cards were the top tier leaders and pushed the envelope for Powercreep and dungeons had to evolution to counter these newer and more powerful teams. Many players did feel a bit left out as they could not keep up (myself included) when dungeons were designed around Ra Dragon and his 144x multiplier when all you had was paltry 25x rainbow cards. However, GungHo has somewhat amended this problem and introduced a top tier farmable leader in Myr along with shifting the meta to heart-crosses and we are currently experiencing a period where MP cards are still strong, but do not reign supreme. Thus, I want to explore the future of the Monster Point System and perhaps speculate what we have in store for us. The Good, the Bad, and the Dragons?